The geologic story of Red Rock Canyon began about 300 million years ago when sand and gravel washed down from the ancestral Rocky Mountains to form alluvial deposits which became the Fountain sandstone on the edge of the present location of Manitou Springs. 50 million years later, shifting dunes of fine sand drifted into the area to become the red Lyons sandstone of Red Rock Canyon itself. For the following 100 million years, the future Red Rock Canyon was near the edge of the sea – a tidal flat, a shoreline, a delta, and a tidal flat again. Successive layers of sand and mud created the Morrison, Purgatoire, and Dakota formations. Then with rising waters the future Red Rock Canyon became the bottom of a shallow sea. Mud and sand and sharks’ teeth and seashells accumulated, and more sand and more mud – the Colorado group, the Fort Hayes limestone, the Smoky Hill shale, and the Pierre shale. And then, a wave of geologic upheaval, the Laramide revolution, swept in from the west uplifting a new range of mountains, our Rocky Mountains. The mile deep layer of old sediments was lifted up, deformed, bent until in the future Red Rock Canyon strata stood on end. The sedimentary strata of Red Rock Canyon now end abruptly where they were sheared off by the Ute Pass Fault. Rocks south of the Ute Pass Fault in Section 16 are much older, the 1.7 billion year old Idaho Springs gneiss and the billion year old Pikes Peak granite. In one area, cracks in the igneous rocks were filled with sand in the Cambrian period creating sandstone dikes which are not part of the stratigraphic column. Erosion of the upturned sedimentary strata created a series of parallel ridges and canyons. Sand and gravel washed down from the Rocky Mountains to form alluvial deposits which became mesas. 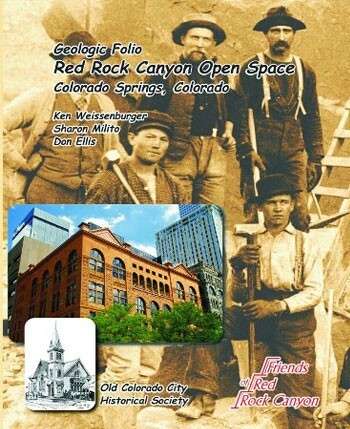 Red Rock Canyon geology and its relation to our local history is the subject of a recent book, Geologic Folio Red Rock Canyon Open Space Colorado Springs, Colorado by Ken Weissenburger, Sharon Milito, and Don Ellis. This book was awarded the 2011 Caroline Bancroft Award by History Colorado and is available from the Old Colorado City Historical Society.